Prime Ministerial succession does not occur automatically and instantaneously under our constitution, but only after a transition of two to three weeks, after the outgoing Prime Minister has tendered his formal resignation to the Governor, and after the Governor has formally appointed the new Prime Minister. Unfortunately, some Conservative partisans and even some Conservative MPs have conflated the election with the appointment of a new government and entirely ignored the period of transition! Stephen Harper became Prime Minister on February 6th, 2006 — not on January 23rd, 2006. Parm Gill, Conservative MP for Brampton-Springdale, has conflated the two dates on Twitter. 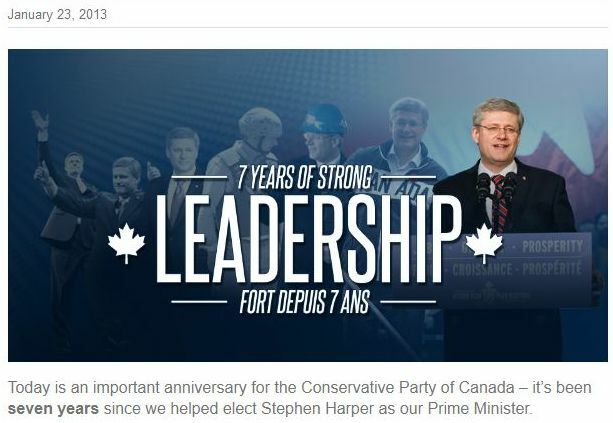 First, the Harper government took office on February 6th, 2006 and not January 23rd. Third, Gill is a backbench MP and not a Ministers of the Crown, so he can’t properly describe himself as a member of “the government”! Can you spot the two errors from the Conservative Party’s website? The results of the election of the 39th Parliament of Canada came in on January 23rd, 2006 and resulted in what would become the second of three consecutive minority Parliaments. In the 38th Parliament (2004-2006), the Liberals held the plurality of seats and Prime Minister Martin’s 27th Ministry continued as a minority government. Stephen Harper’s Conservatives gained the plurality in the 39th Parliament (2006-2008); upon seeing the results, Prime Minister Martin announced his intention to resign and called upon the Governor General to appoint Conservative leader Stephen Harper as his successor. However, Prime Minister Martin did not submit his formal resignation until February 5th, 2006, and Governor General Michaelle Jean did not appoint Stephen Harper as Prime Minister until February 6th, 2006! The dying days of the Martin government, from January 23rd, 2006 to February 6th, 2006, formed the “caretaker period” and provided for the transition from the 27th Ministry to the 28th Ministry. The transition from one government to another generally takes two to three weeks in Canada — it most certainly does not occur instantaneously after the results of the election and party standings become known. In countries where minority parliaments and coalition governments are common, this period of transition also involves a process of government formation, namely, crafting government programs based on backroom negotiations and the platforms of the political parties involved. 27th Ministry: Paul Martin served as Prime Minister from his appointment on 12 December 2003 to his resignation 5 February 2006. 28th Ministry: Stephen Harper has served as Prime Minister since Governor General Jean appointed him with the official commission to govern on 6 February 2006. His “term” will end only upon his resignation (or, theoretically, death). Conservative partisans may celebrate January 23rd as the anniversary of the Conservatives’ first electoral victory and the date on which Prime Minister Paul Martin announced his intention to resign so that the Governor General could appoint Stephen Harper as his successor. But they most certainly cannot portray January 23rd as the anniversary of forming government! This entry was posted in Appointment of PM, Caretaker Convention, Constitution (Conventional), Crown (Powers and Office), Governor's Discretion, Succession (Prime Minister). Bookmark the permalink. The ignorance of our elected members on how our parliamentary system works never ceases to amaze.